Is it all due to globalization? Perhaps the most striking aspect of the global financial crisis of 2008 is how little actually changed in its aftermath. Prior to the chaos, the global economy had been expanding rapidly, globalizing quickly and growing more egalitarian. Meanwhile, in the United States, the economy was expanding rapidly, globalizing quickly and becoming less egalitarian. After the crisis, all those trends continued. In the wake of the crash, Professor David A Moss, an economic historian at Harvard Business School, was confronted by a colleague, who demanded he overlay two graphs. One plotted financial regulation and bank failures, the other income inequality. Moss wondered whether the global economic settlement was causing income equality to grow. But Moss’s suspicion that the correlation implied causation was immediately challenged by other economists. “Cars go faster every year, and GDP rises every year, but that doesn’t mean speed causes GDP growth,” R Glenn Hubbard, dean of Columbia Business School, retorted through the pages of the same newspaper. What was undeniable was that income disparities in the United States were growing before – and after – the crash, triggering theories that it is globalization itself that is causing the wealth gap to grow. Although some experts speculated that the crisis would ‘reboot’ the US economy, the wealth gap grew further following the great recession of 2008. In a 2017 paper, New York University economist Professor Edward Wolff found that the period 2007 to 2010 – which spanned the crash and the following recession – “saw a sharp elevation in wealth inequality”. Between 1983 and 2016, he wrote, “the largest gains in relative terms were made by the wealthiest households”. The middle class saw no change in wealth, while the average wealth of the poorest 40% of the population fell by $15,800. But if footloose capitalism has failed the American middle class, its effects elsewhere are different. 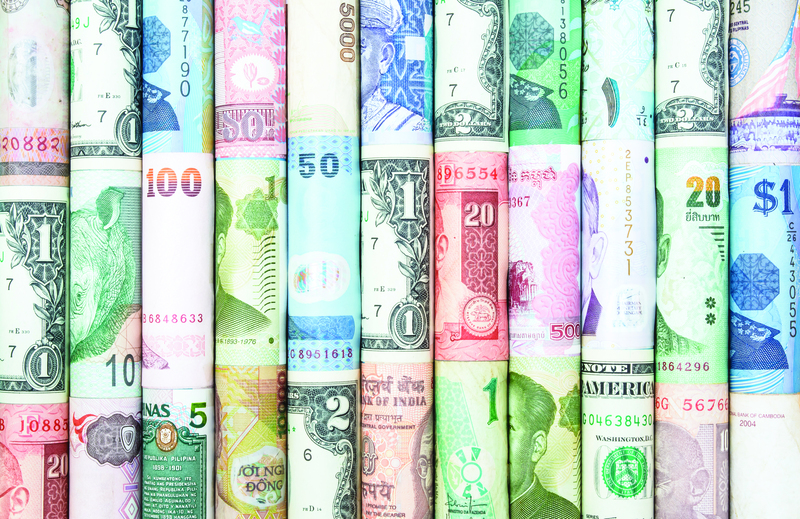 Evidence suggests that globalization is leading to the world’s wealth being shared among more countries, and among a larger spread of the world’s population. 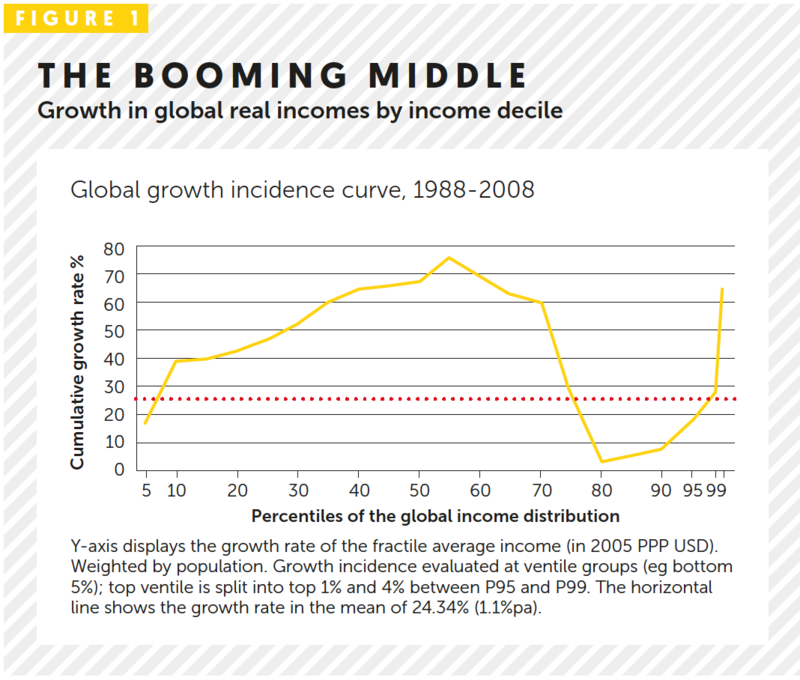 Christoph Lakner, a World Bank consultant, and Branko Milanovic, senior scholar at the LIS Cross-National Data Center, discovered that the fifth and sixth income declines of the world population – the global middle class – had seen their real incomes double in the 20 years preceding the crash (Figure 1), and that nine out of those ten winners were from Asian nations. Since 2008, they say, the trend has largely continued, albeit in a “slightly less dramatic” form. 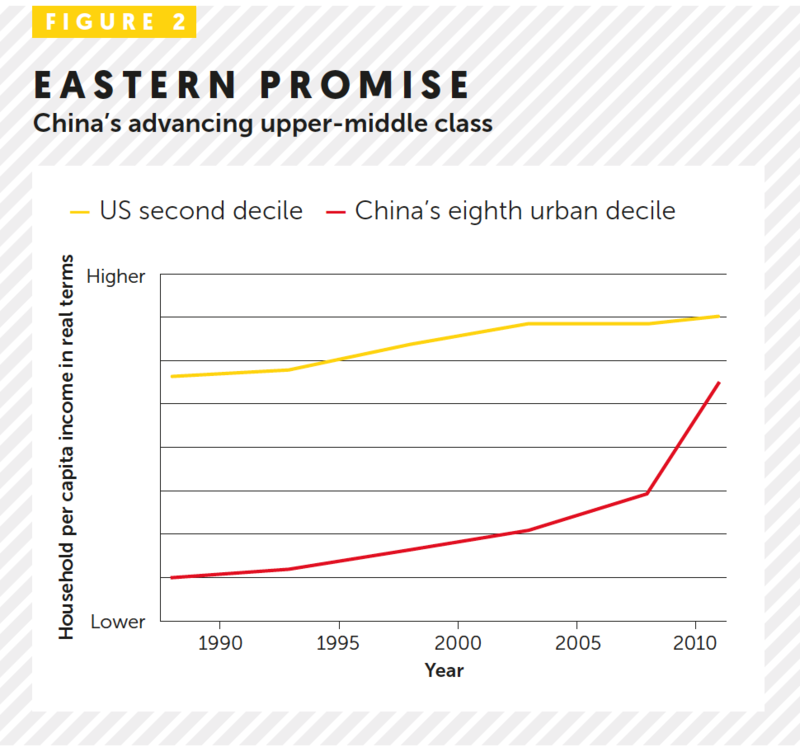 The diverging fortunes are charted by Lakner and Milanovic by comparing the growth in real wealth in the second income decile in the US to the eighth income decile in urban China (Figure 2). Lakner and Milanovic justify the comparison – the second poorest group in the US to the third richest in China – by way of benchmarking the world’s richest nation against a relatively poorer peer. While the second income decile in the US saw their real incomes grow 20% between 1988 and 2011, the urban eighth income decline in China saw it multiply by a factor of 6.5. In short, the Chinese upper-middle-class saw its wealth shoot up, while for poorer Americans it was virtually flatlining. “The absolute income gap, still significant before the onset of the  Great Recession, has narrowed substantially,” write Lakner and Milanovic. This duality of outcomes from globalization presents major challenges for leaders, both of businesses and governments. 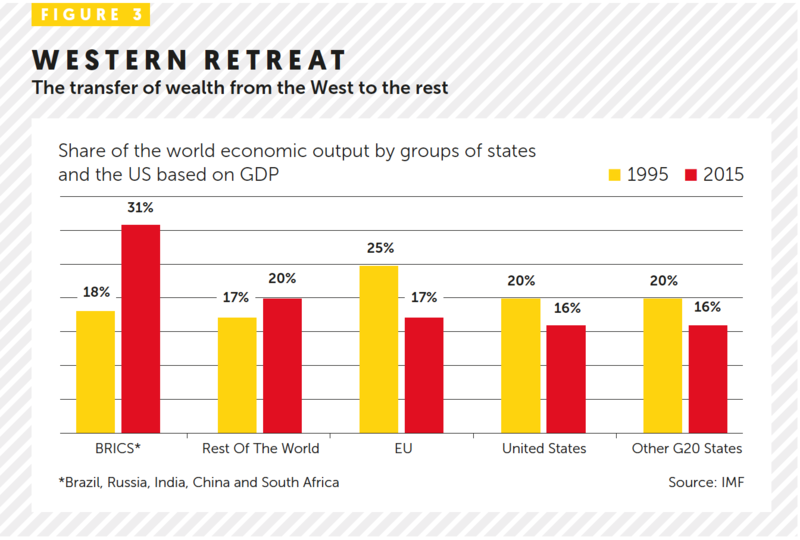 The transfer of global wealth from richer nations to traditionally poorer countries is not a victimless shift (Figure 3). “Policies on immigration and free trade sometimes increase inequality within a nation, yet can make the world a better place and often decrease inequality on the planet as a whole,” argues Cowen.